WordPlay: Yes, In My Backyard! Agility Girl: Are jumpers courses more confusing? AgilityNerd: Seventy Two Backyard Courses! ThePurplePuppy: Backyard Training – Where Less is More! The Spotted Tongue: Backyard agility…with no yard! 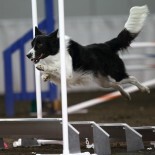 The Days of Johann, an agility dog! : Backyard Agility Training! Allstaragility’s Blog: Backyard Training- Keep it Simple! Awesome Agility Adventures:Jefferson’s Journey: There is No Place Like Home! Just A Pup: Doing the best we can with what we have!